Showing at the moment in the National Gallery of Australia in Canberra is an exhibition of work by the renowned World War I official war artist, Will Dyson. During the Anzac Day week the gallery also screened Oh! What a Lovely War and offered recitals featuring Australian civilian women’s poetry of the Great War. Still running at the National Museum is Remembering 1914–1918, an online space where people can upload an image of a Great War-related object and an accompanying story of connection with that object. 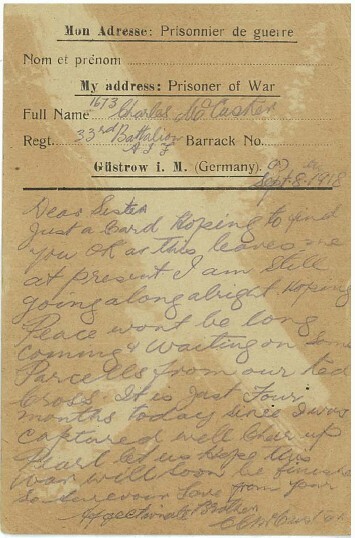 Understandably, given it was April, the National Archives was advertising again its Discovering Anzacs site. And currently on tour from the National Maritime Museum are the exhibitions War at Sea: the Navy in WWI, Battle of Java Sea and Guardians of Sunda Strait – the World War II Loss of HMAS Perth and USS Houston. I could go on. I’ve said to the directors of the other cultural institutions – the National Gallery, the National Library, Sound and Film Archive, the National Portrait Gallery, the Museum for Democracy, if all Australians do over the four years of the centenary is come to the Australian War Memorial, we’ve failed. Because it’s important that we understand what happened in these four years and how it informs who we are now. What music were we listening to, what sort of work were people doing, how was the war reported? And what was the reaction of Australians to it and who were the whistleblowers? What was our culture? All of those very things that give you a comprehensive sense of who we were and how it informs who we are now. Further on, the Director said the National Museum and some state-based institutions were the ones best positioned to cover the 19th century frontier wars. Whatever his motives, the Director was right in thinking some themes transcend the remits of institutions, regardless of their groupings and numbers. For some years now, so-called ‘national collecting institutions’ have been located under Arts within the Communications and the Arts portfolio. 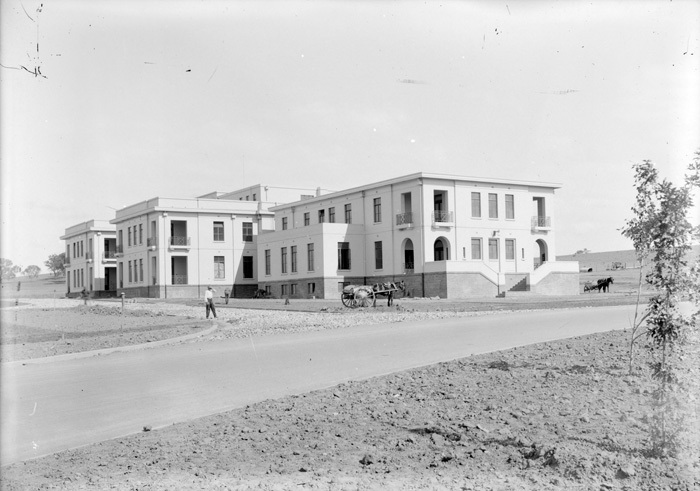 Administratively, this is where the National Library, the National Gallery, the National Museum, the National Maritime Museum, the National Portrait Gallery, the National Film and Sound Archive, the Bundanon Trust, and the Museum of Australian Democracy sit. It’s quite a list. Three other national collecting institutions, the Australian War Memorial, the National Archives of Australia and the Australian Institute for Aboriginal and Torres Strait Islander Studies (AIATSIS) are scattered across Veterans’ Affairs, Attorney-General’s and Education and Training. The reasons are partly historical and not entirely logical. In fact, the complete picture is messier still. There are also dozens of museums and collections run by the Australian Defence Force, by various Commonwealth scientific agencies, and by the Australian National University. Not to mention the states. What federal and state cultural arts, education, Indigenous and veterans’ affairs ministers’ vision and policy framework knits all of these bodies together? What fosters cooperation and mapping collection and exhibition coverage for gaps and overlaps? Apart from diminishing amounts of tax payers’ dollars, the cynical answer is … nothing much. Curiously, on some topics, laissez-faire seems to have worked. As if by coincidental collusion, over the past three decades many of these institutions set about rebalancing a previous lack of interest in Indigenous war service. Seeing this trend in a bigger context, Peter Cochrane has termed this ‘the new inclusiveness’. An early marker was the appointment in 1985 of Reg Saunders, Australia’s first Aboriginal commissioned officer, to the Australian War Memorial Council. With the efforts of writers such as Robert Hall and David Huggonson and a War Memorial photographic exhibition, Too Dark for the Light Horse, things began to change in the wider community too. AIATSIS, of course, was long aware of Indigenous war service and in 2003 supported a documentary by Glen Stasiuk, titled The Forgotten. 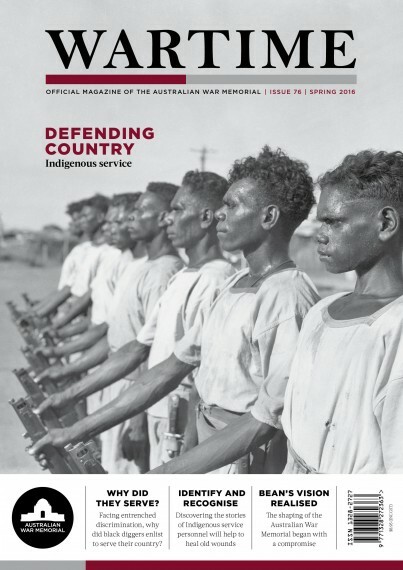 As for the academy, ‘When I started researching Aboriginal and Torres Strait Islander military service history in 2004, this was a very niche academic area’, wrote Noah Riseman, introducing a special theme section of Aboriginal History. In parallel, Indigenous veterans’ families documented their own memories and, from the late 1980s, community action led to the erection of memorials and the creation of the Aboriginal and Torres Strait Islander Veterans and Services Association. In 2006, for the first time, an Indigenous commemorative ceremony was held at the Melbourne Shrine. Recognition has grown apace. Earlier scholarship has been extended by people such as Chris Clark and Philippa Scarlett, libraries and archives have produced guides to sources and DVA has created resources for schools. The War Memorial repeated Too Dark for the Light Horse in 1999–2001 and made concerted efforts in its education programs galleries and web resources to foreground Indigenous war service and broaden Indigenous representation in the collections. Now there is the Captain Reg Saunders Gallery and Courtyard, a special theme issue of the magazine Wartime (Spring 2016: ‘Defending country: Indigenous service’) and a new exhibition, For Country, for Nation, ‘dedicated exclusively to exploring Aboriginal and Torres Strait Islander stories of military service in times of war and peace’. At the ANU the National Centre for Indigenous Studies is finalising a large program of research, Serving our Country, including oral and video recorded interviews of Indigenous servicemen and women’s families. Fittingly this correction culminated with Aboriginal and Torres Strait Islander veterans leading the march in Canberra for Anzac Day. To come now to our review, at the National Archives of Australia (NAA) there was recently a program of talks offered by its Brisbane office (Serving Country – Aboriginal and Torres Strait Islander Diggers), and, at its Canberra headquarters, two new exhibitions about Indigenous Australians’ war service. The first of these exhibitions, Indigenous Australians at War from the Boer War to the Present, was developed by the Shrine of Remembrance, Melbourne, and has been on tour since 2011. Its structure (chronological by conflict), content (overwhelmingly photos but with some video recordings of Indigenous voices provided by an oral history project from Melbourne’s Australian Centre for the Moving Image) and opportunities for interaction show basic imagination, which is perhaps understandable given the show was designed for touring. 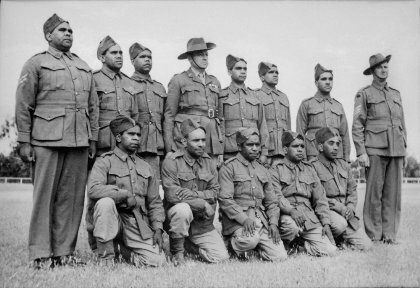 Even so, the power of the content is undeniable and the irony – more a cruel joke – of Indigenous service is clear: Indigenous Australians had to overcome rules and prejudice to enlist, and overcome them again readjusting to civilian life and seeking acceptance in employment, elections, soldier settler schemes, RSLs and hotels. The very title of the second Archives exhibition, Facing Two Fronts: the Fight for Respect, signals its intent: to focus more directly on the pursuit for social justice, recognition and self-determination during the aftermath of service, with the titles of its five main screens saying it all: ‘Being labelled’, ‘Standing up’, ‘Fighting for country’, ‘Taking control’, and ‘Remembering’. Like the Shrine exhibition, there is video testimony and reminiscence, in this case drawn from the above-mentioned ANU Serving our Country project. Better still, to complement these exhibitions, the Archives has drawn on its vast resources of official files, displaying scans of letters, news cuttings and photos. The overall theme and, in particular, this content is powerful and compelling. It is highly unusual for a cultural institution to present concurrently two public exhibitions on the same theme in the same building. Comparison is unavoidable. On the one hand, the Shrine exhibition is in the Archives’ temporary exhibitions gallery; it has an entrance and introductory panel, framed reproductions of photos on walls, an obvious exit with comments book, a design logic to encourage visitors in a particular direction, and a separate zone for the videoed testimonies. On the other hand, the Archives’ exhibition content is entirely digital (though, regrettably, it is not a genuine digital exhibition accessible via its website – presumably because of budget or rights issues). It can be viewed via touch screens which present menus allowing access to scans of dozens of supporting documents. And its location? In a staff and public passage way which connects the Treasures and Federation gallery at the front (north) end of East Block with the central foyer of the building. The underlying message is as problematic as the sign out on Queen Victoria Terrace which reads, ‘Yes we are open! Come inside’. If the Shrine exhibition in some ways shows little imagination, the Archives’ Facing Two Fronts shows too much. Off this ‘gallery’ run foyers to toilets, meeting rooms, a Parents and First Aid room and the temporary exhibitions gallery. Introductory panels are needed at both passage way entrances. The five screens themselves compete for attention with historic plaques about the building’s history, other signage and the side foyers. At different times while I was trying to view screens and listen to the audio, Archives staff, visitors from other departments and workmen walked through, and in the last case, wheeling furniture. Naturally, all were chatting away as I concentrated on the audio, one of them curious to know what I was doing. I feel quite conflicted about the Archives. Australia needs well-resourced, well-led truly national archives, trusted equally by governments of all persuasions, the media, researchers, their professional peers and the public. NAA is quite capable of producing wonderful exhibitions with challenging messages, Between Two Worlds from twenty years ago and, more recently, Without Consent and Shell-shocked immediately springing to mind. And NAA is quite capable of delivering a web presence and digital exhibitions as good as those by the United Kingdom National Archives and which matches the digital philosophy NAA preaches across the bureaucracy. As for the two shows under review, I cheered when I read, ‘The National Archives is proud to be presenting these complementary exhibitions in 2017 – a year that marks the 25th anniversary of the Mabo Decision and the 50th anniversary of the 1967 referendum’. Presenting exhibitions is pretty much the only thing all national cultural institutions do and our experience of war pretty much the only subject they all try to cover. I’ve seen odd items in entrances to government agencies – such as IP Australia – and ship models next to lifts in a mining company. Displays in corridors rarely work well, though; Facing Two Fronts – its subject, curators and audience – deserved better. * Michael Piggott is Treasurer of the Honest History association and an archivist of many years’ experience. He has a chapter in The Honest History Book. The chapter is about the Australian War Memorial and the legacy of Charles Bean.